Is Marabou a wellhead and “first purchaser” in the eyes of state regulatory authorities? Yes. 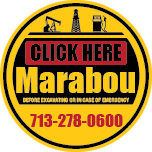 Marabou is a registered first purchaser of wellhead volumes in Texas, Oklahoma and Louisiana. Is Marabou a qualified Texas Railroad Commission operator of Oil & Gas gathering pipelines under the new compliance obligations? Yes, MMS and our sister company Marabou Superior Pipeline are qualified operators of oil and gas gathering pipeline systems now under the jurisdiction of the Texas Railroad Commission inclusive of compliance obligations, reporting and pipeline integrity certification. Marabou is also qualified operator and provided in Oklahoma, Wisconsin, and Louisiana. How will Marabou ensure that the producer will not be subject to any punishing imbalance penalties? Provided we are able to monitor and/or manage your daily wellhead volumes, Marabou will be responsible for and fully indemnify the producer against any and all imbalances and cashout penalties. That means our producer partners can focus on doing what they do best… finding oil and gas. We manage it from there. Will Marabou utilize the industry standard NAESB Base Contract for Sale and Purchase of Natural Gas? Absolutely. The NAESB has become the industry standard and addresses all aspects and possible circumstances of a transaction. There are no hidden terms or conditions that could negatively effect your netback or the market price for your production. Can Marabou execute hedges on behalf of a producer? Sure. Marabou‘s role can be to either advise or execute. If our producer partner has a special hedging objective, like being assured of a fixed price over time to fulfill a lender’s requirement or to meet the budgetary requirements of investors, or to be assured that the price it will receive over a certain time period in the future will never be lower than $X, for instance, we will evaluate the various financial products available to meet that objective (via fixed price, costless collars, outright puts (floors), etc.) and either suggest a possible course of action or execute on behalf of the producer. Does the producer have to be responsible and hold the downstream transport? Not necessarily. Marabou is happy to arrange and be responsible for everything downstream of the wellhead, whether it’s gathering, processing, intrastate or interstate transportation, short-haul, long-haul, short-term or long-term. And the assignment of producer’s existing transport to Marabou is just as easily accomplished. Can Marabou accommodate smaller producers or non-strategic properties with small daily production? Of course. Our producer partners are all small and mid-sized independents. Regardless of the amount of your daily production, or whether it represents 100% of your production or only a small non-strategic piece, we’ll give you the industry-best level of service and personal attention that our existing customers have come to know and appreciate. We take great pride in the close, personal relationships that we’ve developed with our producer partners over the years. We’ve grown steadily based on those relationships that were built upon trust – a trust earned through consistent, reliable and predictable performance.